Detailing the physical features, habits, territorial reach and other identifying qualities of the Wavy-Lined Heterocampa. The mossy green and brown colors on the Wavy-lined Heterocampa allow the adult to blend into the verdant foliage of its chosen host. Wavy-lined Heterocampa Moths are a lovely shade of sage green. 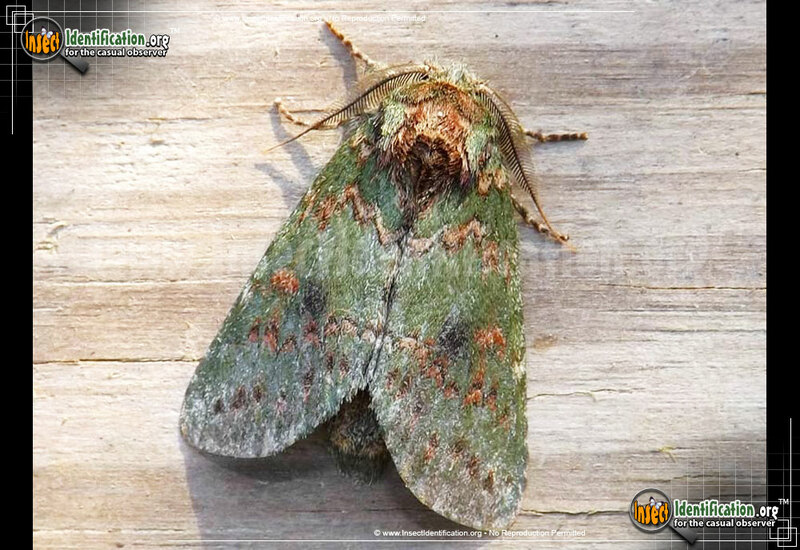 Green fringe-like hairs from the abdomen may stick out from under the sides of the wings. Two rows of tan or brown scalloped lines cross the forewings. A dark smudge appears on the lower part of them as well as a brown, bean-shaped spot. The lower part of the wings have small wedges of black color near the bottom. Antennae are comb-like. Familiar sights on the eastern part of the continent, Wavy-lined Heterocampas do well in long summers. Caterpillars feed on the leaves of a variety of deciduous trees like apple, willow, birch, and hickory as well as on woody shrubs. They may be green or brown overall and have flat faces. The dorsal (top) side typically has white or yellow markings that may extend the length of the body, or just simply form a 'V' at the rear. A green 'X' may be be present at the center of the body. Red, brown, and orange colors also are also possible along the body, helping it look more like a dried out leaf. The rear end splits into a two-pronged fork, or 'tail'. Some individuals are unique in appearance thanks to a set of antlers, much like those seen on deer or elk, rising out of the body just behind the head. Two broods can be produced each year if the season is warm enough.